Susan Kane studied Printed Textile Design at Manchester Polytechnic in the 1980's and received a First Class BA(Hons). Following this she worked in London for various design studios, including 3 years with Mary Quant, designing her ranges in the UK and Japan. Over the following 20 years she has worked in partnership with other designers, selling work in the UK, New York, LA and Tokyo. "From an early age it was clear to me that art and design were to be my future- always drawn to colour, form and fashion, always painting and drawing. I have a vivid memory from the age of 8, of seeing Paul Klee prints, 'Senecio' and 'Sinbad the Sailor', whilst at the house of an artist friend of my parents. In recent years I made the transition from textile design to painting, which was my first love. 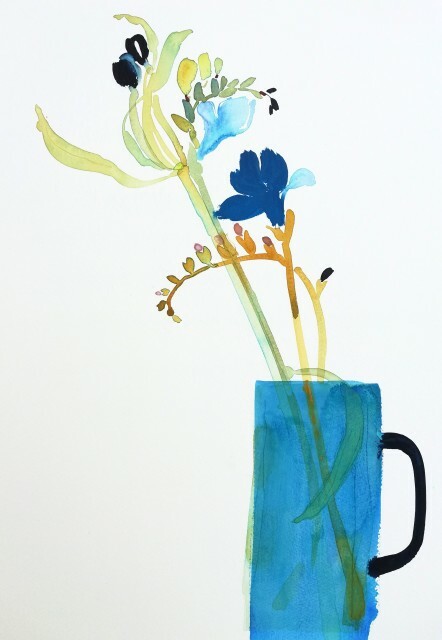 Currently I enjoy painting plants and flowers and mid-century vessels. I work predominantly in watercolour, acrylics and monoprint either on paper or cotton/linen. I try to bring a freshness and spontaniety to my subject matter." Susan Kane debuted successfully in our 2016 Christmas exhibiton and had solo exhibitions in 2017 & 2018. She will be returning in May 2019.